A federal judge is considering ordering Pacific Gas and Electric Co. to inspect its entire electric grid in the coming months and turn off power during windy weather if it has not determined its equipment is safe for those conditions. U.S. District Judge William Alsup said in an order Wednesday those are among the new terms of probation he might impose on PG&E as part of the sentence the utility is serving for its criminal conviction in the 2010 San Bruno pipeline explosion. Alsup’s order comes after he began demanding answers from PG&E about its role in California’s deadly wildfires shortly after the Camp Fire broke out in Butte County on Nov. 8, killing 86 people and destroying nearly 19,000 structures, raising the possibility of new court-imposed restrictions against the utility over the devastating conflagrations. While the cause of the Camp Fire remains under investigation, PG&E quickly disclosed its equipment had problems in the area. Also Wednesday, a federal probation officer said PG&E probably violated its probation in the pipeline case because it failed to properly disclose a settlement with local prosecutors over its role in sparking a 2017 Butte County wildfire. PG&E is required to report government investigations to the probation office. Alsup, the San Francisco judge overseeing the probation, said in the order he was considering the new measures because of “PG&E’s history of falsification of inspection reports.” The utility should examine its grid and remove or trim all trees that could make contact with its power lines or other equipment in high winds, sparking dangerous wildfires such as the series of 2017 North Bay blazes that state officials already pinned on PG&E, he said. PG&E would have to manage vegetation even beyond the standards set by California law, extending to any tree or branch at risk of falling into power lines or bending in the wind and hitting electrical equipment, under the judge’s terms. PG&E would be further required to document its inspections and have an engineer issue corresponding safety ratings under various levels of wind conditions. The engineers would be required to make safety determinations in writing and certify them under oath. Then, starting this wildfire season and thereafter, PG&E would be allowed to supply electricity only to parts of its grid that were deemed safe for the prevailing winds at the time, the judge said. 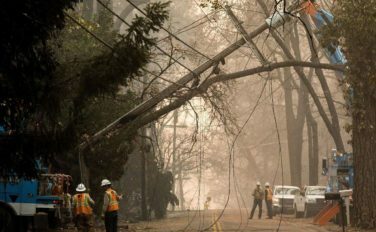 By way of example, he said if winds of up to 30 mph were expected in a certain county and PG&E hadn’t yet rated the lines there as safe in those conditions, the utility would have to turn off the power. Alsup ordered PG&E to respond within two weeks. A hearing is set for Jan. 30. PG&E said it is reviewing Alsup’s order. “We are committed to complying with all rules and regulations that apply to our work, while working together with our state and community partners and across all sectors and disciplines to develop comprehensive, long-term safety solutions for the future,” James Noonan, a spokesman for the utility, said in an email. Alsup’s inquiry is among PG&E’s many fire-related legal problems. It faces billions of dollars in liabilities stemming from the 2017 North Bay firestorm and the Camp Fire, which have resulted in hundreds of lawsuits in state courts. That exposure has clouded PG&E’s financial and regulatory future, sending its stock price plummeting and casting doubt over whether the company can survive in its current form. PG&E could challenge Alsup’s orders, arguing that his deadline for a cleanup or partial shutdown by this summer is impossible to meet. But a criminal defendant who has been granted probation faces a harder legal burden than one initially charged with a crime. To show a probation violation, prosecutors must only present proof by a preponderance of the evidence — or more likely than not — rather than the more demanding standard of beyond a reasonable doubt that is required for a conviction. Lawyers who represent fire victims in lawsuits against PG&E praised Alsup’s plan. “If PG&E contests this, then it completely undermines the sincerity of their repeated mantra that the safety of their customers is their first priority,” said Frank Pitre, whose firm has sued the utility over 2017 and 2018 wildfires, and was involved in civil litigation stemming from the San Bruno explosion. Mindy Spatt, spokeswoman for The Utility Reform Network consumer group, said court intervention is needed because state regulation has fallen short. He instructed the parties to send a copy of his order to the commission and to the California Department of Forestry and Fire Protection, both of which he invited to file their own responses by Jan. 25.